I know, I know. That’s a bold title. In general, I shy away from dubbing any recipe “the perfect ____!” or “best ever ____!” But this time, I think it is justified. 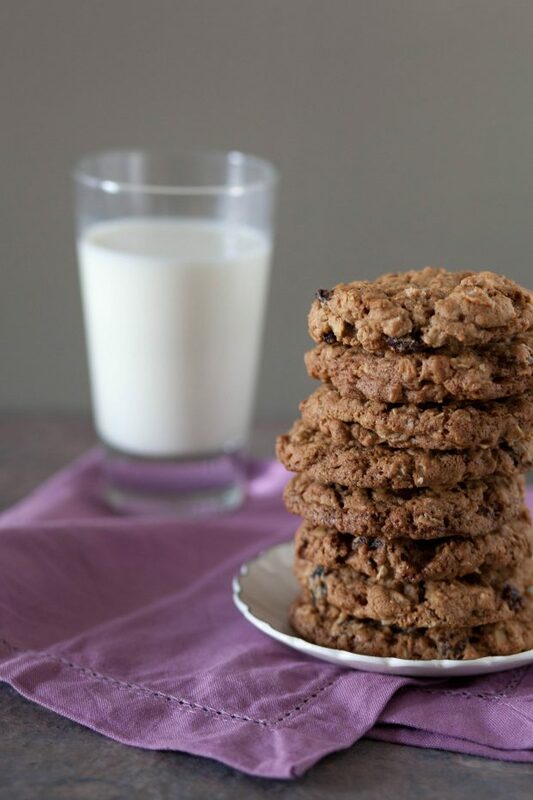 Oatmeal raisin is surely one of the most classic flavors of cookie out there. They can be so, so very good. However, in my experience, they often don’t live up to their full potential. Too thin, too crispy, too dry…so many wrongs can plague them. I can’t tell you how many times I’ve gotten one as part of a catered lunch at work only to take a single bite and deem it not worth the calories. Well, leave it to Thomas Keller to take all the wrongs with this cookie and make them right. 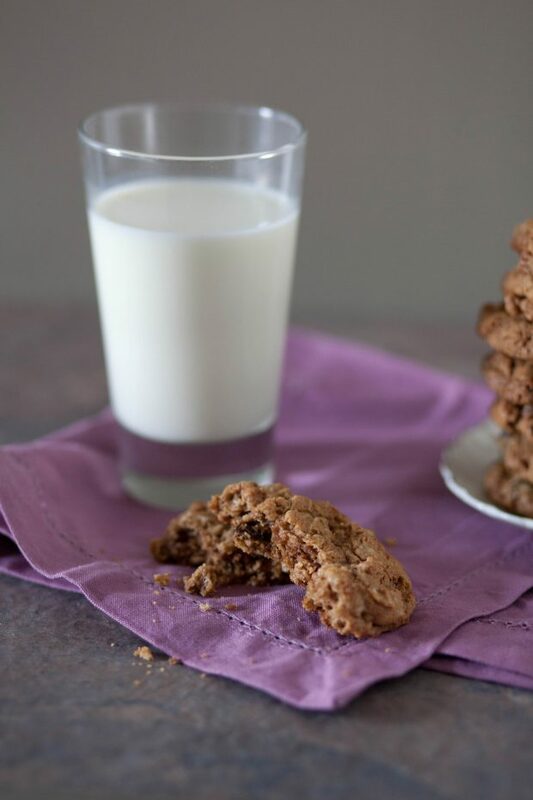 With just a few minor changes from a more typical oatmeal raisin cookie recipe, these cookies reach new heights. They are a nice, large size, perfectly thick, chewy, and dotted with plump raisins. In my mind, the most crucial step was soaking the raisins before mixing them into the dough. It rehydrates them a bit, and helps keep the cookie chewy and moist. I brought these cookies in to a new work setting and everyone was raving about them. People were thanking me all day long. Don’t thank me, thank Thomas Keller! He’s the bomb. In a medium bowl, combine the flour, cinnamon, baking soda and salt; whisk to blend. In the bowl of an electric mixer, beat the butter on medium speed until smooth and creamy, about 2-3 minutes. Add in the sugars and beat on medium-high speed until light and fluffy, about 3-4 minutes. Scrape the seeds from the vanilla bean into the bowl and mix to blend in. With the mixer on medium-low speed, blend in the vanilla extract and eggs just until incorporated. Scrape down the sides of the bowl. With the mixer on low speed, add in the flour mixture in two additions, mixing just until incorporated. With the mixer on low speed, stir in the oats and raisins, mixing just until evenly incorporated. Cover and refrigerate the dough for 30 minutes. Preheat the oven to 325˚ F. Remove the cookie dough from the refrigerator and let stand at room temperature for about 10-15 minutes. Line baking sheets with parchment paper or silicone baking mats. Use a large dough scoop (about 3 tablespoons) to drop the dough in rounds on the baking sheets, about 2-3 inches apart. Bake, rotating the pans once halfway through baking, until the cookies are just golden brown and nearly set (they will continue to bake for a few minutes once removed from the oven, so try not to overbake), about 17-18 minutes total. Repeat with the remaining dough. A blend of regular and golden raisins is recommended in the book. To rehydrate them, place in a bowl and cover with hot water. Let stand for 30 minutes. Drain the raisins and spread into an even layer on clean kitchen towels. Press gently with another towel to help blot away all the excess water.